Home / women health / Missed my periods for a whole year, Is this the reason I have been unable to conceive? Missed my periods for a whole year, Is this the reason I have been unable to conceive? Going for a whole year without periods is certainly abnormal. In fact, in the absence of pregnancy or use of certain contraceptives, an explanation should always be sought if periods disappear for a period of 3 to 6 months. The prolonged absence of periods implies a failure to release an egg every month (ovulation). Consequently, conception will not occur in the absence of regular ovulation. The immediate thing to do is to seek a gynecological review. An assessment of your reproductive function will give some pointers as to why you are not getting periods. On top of a physical exam, you will need some tests to confirm the suspected diagnosis. These will include hormone tests and imaging of the reproductive system. Additional tests may be advised as well, depending on the findings following the initial assessment. Most women will not be found to have a serious cause for the missed periods. The commonest cause is a condition called ‘polycystic ovarian syndrome’, or PCOS for short. In its basic form, it just means irregular ovulation which is caused by an imbalance of hormone production. Others may be found to have abnormalities of other hormones that interfere with the reproductive cycle. Rarely, some women will be found to have severely diminished ovarian function, medically referred to as ‘premature ovarian insufficiency’. 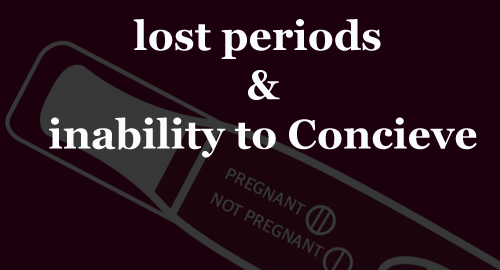 A large spectrum of other disease conditions can also be responsible for missed periods. Once a specific diagnosis is made, you will get a recommendation for the most appropriate treatment. As you are also trying to conceive, your treatment will be geared towards the restoration of ovulation and enhancement of conception. If your diagnosis ends up being PCOS, optimization of weight especially for those who may be overweight may trigger the resumption of periods and ovulation. But most women with PCOS will require ovulation tablets for a period of time in order to ovulate regularly and conceive. If a complex or rare diagnosis is made, then a referral to a specialist team may be the way out. Those with premature ovarian insufficiency will, unfortunately, require more complex interventions both to resume periods and to conceive. Conception may only occur with advanced fertility treatment, and likely in combination with donated eggs. Beyond that, premature ovarian insufficiency mandates long-term hormone replacement therapy for continued optimal health. It’s prudent to always seek a timely explanation for missed periods. Pregnancy should always be excluded. Most women will only miss periods transiently, usually for simple reasons that have no long-term implications. But the longer the duration without periods, in the absence of an obvious explanation, the more the urgency for a comprehensive evaluation.